A year ago today, I spent my entire day reading and watching and writing, all trying to gather as much information as I could on the awful events that had unfolded in Las Vegas the previous evening. The attack was horrific, and I still have difficulty processing that something like that actually happened. However, it was also a golden time for gun control activists. For once, they had something they could ban and would probably get banned. The bump stock. It seemed that everyone wanted to see the things gone, including a fair number of Bearing Arms commenters. Even some of those who had little interest in banning them admitted that it wasn’t a hill they were willing to die on. Eventually, the furor died down like it always does. Bump stocks were safe. Or, at least, so we thought. It seems that President Trump, who has taken pretty pro-Second Amendment positions, is in favor of banning the blasted things. Additionally, the media is still interested in presenting an inaccurate picture of bump fire. Today is the anniversary of the Las Vegas mass shooting, the largest mass shooting in recorded history. It’s a painful reminder of the lethal reckoning that mass shootings continue to have across our divided nation and how our elected leaders still refuse to make even incremental progress on enacting basic, common-sense gun safety laws. Bump stocks were used on 12 of the firearms that ultimately killed 58 people and injured several more in the Las Vegas shooting in 2017. The devices allow semi-automatic guns to operate more like machine guns, firing off a rapid succession of shots in a short span, effectively mimicking a fully automatic firearm. “In order to eliminate — terminate — bump stocks, we have to go through procedure. We are now at the final stages of that procedure,” Trump said. “I have told the (National Rifle Association) — bump stocks are gone,” Trump added. It’s that last part that is most surprising coming from Trump, an avowed supporter of gun rights who is generally opposed to any gun control legislation. First, Trump isn’t “standing up” to the NRA. The NRA hasn’t been particularly vocal in support of bump stocks. Its position is that it should be regulated through the executive branch, though, not the legislative. In other words, Trump may well be acting consistently with the NRA’s position. Second, only a fool would believe that a bump stock ban would protect anyone. Bump fire is made easier by the presence of a bump stock, sure, but bump fire predated the stock’s existence. 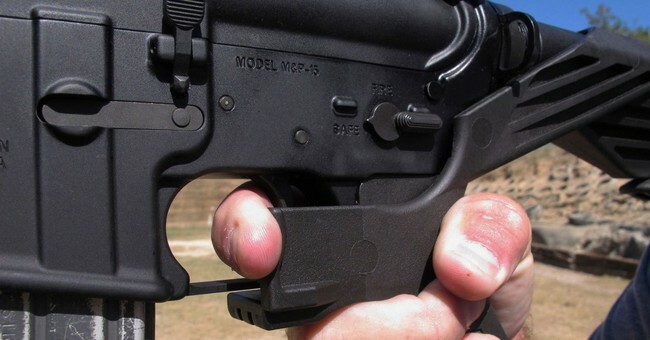 Bump fire can be facilitated by things as innocuous as belt loops and rubber bands. If a mass shooter wants to use bump fire to kill a lot of people, the lack of bump fire stocks won’t actually stop them. The media conveniently ignores this reality. They act like this is some major leap forward, that a bump stock ban will somehow be a major win for gun control and public safety. It won’t. At best, it’ll take away something law-abiding citizens might enjoy using while doing absolutely nothing to make anyone safer. Kind of like every other gun law on the books.